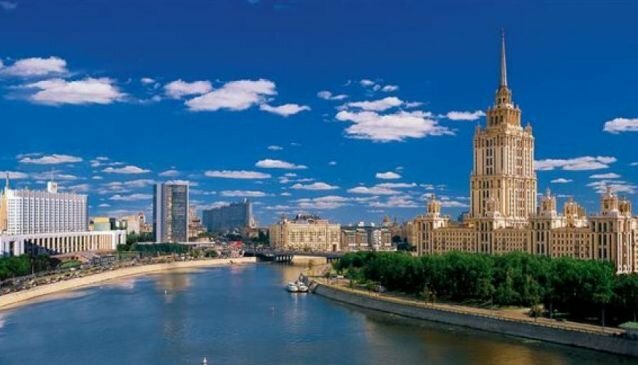 The newly refurbished 5 star Radisson Royal Hotel Moscow is conveniently located in the diplomatic centre of Moscow within walking distance of key tourist attractions and state buildings. There are taxis available around the clock at the Radisson Royal Hotel Moscow which can whisk guests to and from the airports. The Radisson Royal Hotel Moscow was commissioned by Stalin and built in the Soviet neo-classicism architectural style between 1949 and 1957. Guests can look forward to sumptuously elegant guest rooms, extensive gourmet dining options and state-of-the-art Spa and fitness facilities, all topped off by first-class service. Excellent conference facilities and a business centre are available for those wishing to mix business and pleasure. Soaring 206 meters high, the hotel was the largest European hotel of its day and today boasts an extensive original art collection, not to mention several impressive murals and ceiling frescoes.